Industry-wide North American benchmarking study aimed to help operators optimize assets, manage lifecycle costs as equipment ages. he North American wind energy market is aging—the majority of installed wind-turbine equipment averages more than five years in age, and operations and maintenance (O&M) expenses cost the industry $3 billion to $4 billion annually, according to a new benchmarking study by IHS Markit (Nasdaq: INFO), a world leader in critical information, analytics and solutions. The IHS Markit report comprises data from nearly 300 wind projects, representing 30,000 megawatts (MW) of capacity and nearly 20,000 turbines installed in North America (about one-third of the market). Project start dates range from 1994 to 2016. The data represents more than 115,000 turbine-years of operational history, and gives study participants the ability to track projects and turbine performance over time. The IHS Markit study includes data on wind turbines manufactured by more than 15 turbine OEMs. Currently, more than 50,000 utility-scale wind turbines comprising nearly 100,000 megawatts of generating capacity are installed in 42 U.S. states and 12 Canadian provinces and territories, with an average age of six years. By the year 2030, IHS Markit expects those numbers to increase significantly. More than 70,000 wind turbines will generate more than 150,000 MW of power in the U.S. and Canada. Suzlon and MHI, which have both shuttered U.S. manufacturing, are re-focusing in the U.S. as service companies for their respective 6.4 megawatts of combined installed wind turbines, as well as for other OEMs, said IHS Markit. E.ON Climate & Renewables is the latest wind independent power producer (IPP) to launch a business serving turbines owned by others in 2015, following in the footsteps of EDF RE and Duke. “These IPPs are tapping project administration and balance of plant (BoP) experience to capture new deals,” Siavelis said. O&M costs are lowest in the first year of operation, but only slightly. 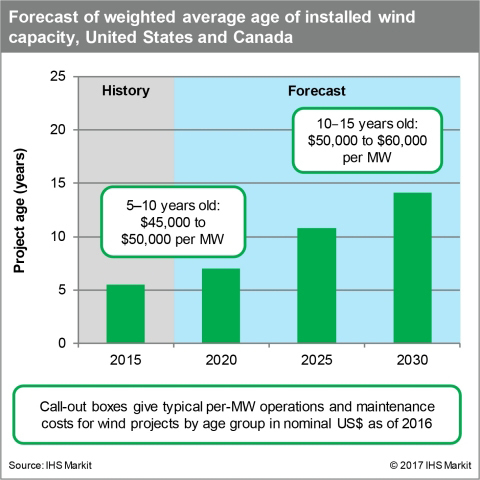 During the first 10 years of a wind turbine’s operations, costs average between $42,000 and $48,000 per MW, IHS Markit said. There is, however, a great range of costs from project to project, with age, location, and O&M strategy all being important factors. As projects continue to age, direct O&M costs (that is, the direct cost of actually maintaining the turbines) increase while indirect costs (e.g., general site administration and other business services) remain steady or even decline, leading to mostly stable total costs on net. However, Cohen said a wide variation in costs exists for wind projects depending on size of the installation, equipment used, and whether maintenance costs are managed by the OEMs, by independent service providers (ISPs), or by operators themselves. The median O&M cost for a project with a full-wrap warranty was slightly more than $48,000 per MW per year in 2016. After the warranty period, the median costs for projects maintained by OEMs and ISPs were nearly the same, while the median cost for projects moved in-house was 19 percent lower. “The study indicates that substantial cost savings can typically be obtained by switching to self-performance,” said IHS Markit, but the authors caution that the data set used in this study is weighted toward large owners that are experienced in self-performance of maintenance. Contracting with an ISP can provide greater flexibility, but the IHS Markit report found that ISPs have a mixed record when it comes to cost savings. ISPs, IHS Markit said, have a ‘long-tail’ of projects in the bottom quartile in terms of cost savings, and owners should note that savings may not be as great as expected in low-performing projects.